Vivaldi Technologies AS released Vivaldi 1.12, a new version of the company's web browser, to the public on September 20, 2017. Vivaldi 1.12 ships with three new features that improve the usability of the browser, and add functionality to it. The new version is already available via the browser's automatic update functionality, and also on the official Vivaldi website where it can be downloaded for Linux, Windows and Mac OS devices. You can run an update check in Vivaldi with a click on the V-icon and selecting Help > Check for Updates from the menu. Vivaldi 1.12 introduces the following new features: a built-in image properties viewer, downloads panel improvements, and an option to control color saturation. We reviewed the new Image Inspector feature of Vivaldi already. Basically, what it does is display meta information about images displayed on websites or individually in the browser. This works best on sites that include metadata information as you get information about the camera, dimensions, sizes, and other related information in this case. 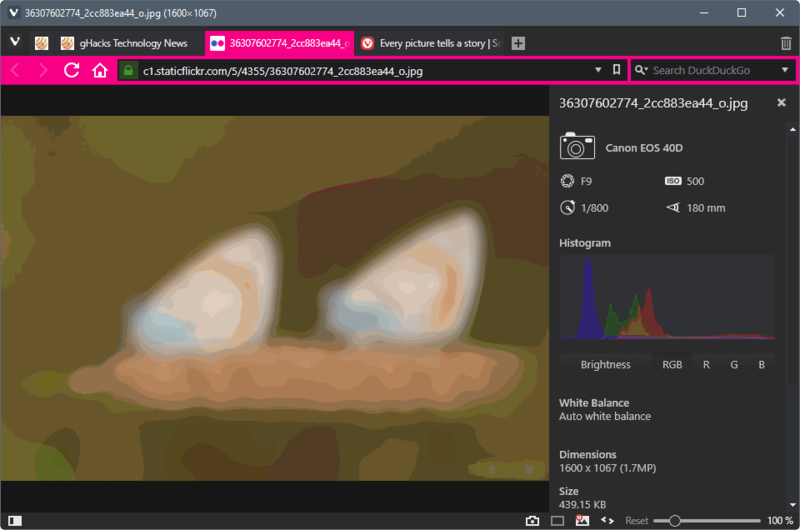 You can display the image inspector's panel either by right-clicking on images and selecting the "image properties" option from the context menu, or by loading any image individually so that it is displayed in the browser tab. If you do the latter, you need to activate the i-icon in the top right corner to display the image information panel of the browser. The Downloads panel is a sidebar in the browser that lists recent downloads and other file download related information. It features a search, and options to open the location of a file on the local system right away. 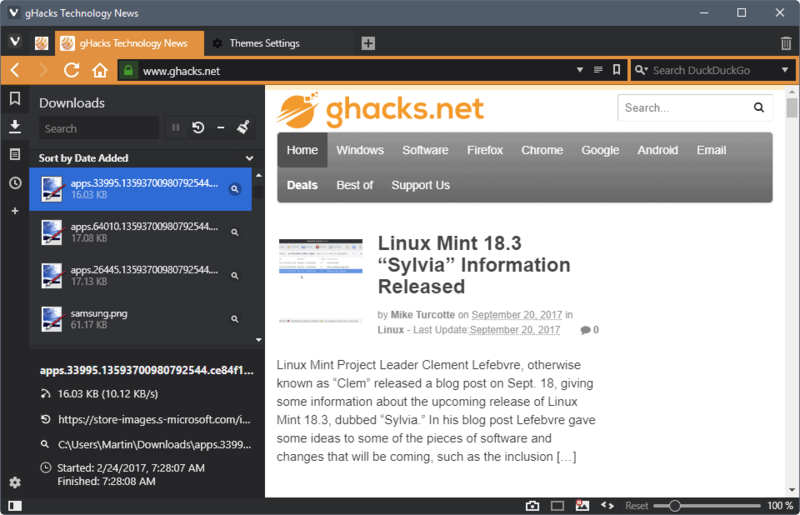 Vivaldi 1.12 displays additional information in the Downloads panel that reveal information about the files name, source, size and download speed, local path, and time and date information. The third new feature introduces a new slider in the appearance settings to limit the accent color saturation. 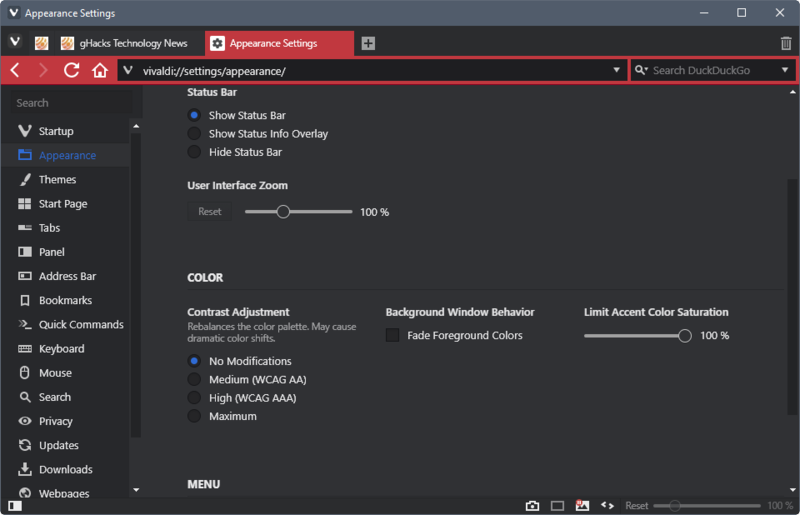 You can load vivaldi://settings/appearance/ directly in the browser's address bar to change the percentage value of color saturation. Now You: What's your take on the update? What would you like to see in future Vivaldi versions? I like that extra download panel information, I wish Firefox would do something similar by default. You said this in a way nicer way than I would have. I don’t know if it is heavier, but I like it a lot. It really feels much more like Opera (presto era), than whatever they’ve been doing lately. My experience with Vivaldi is It takes a long time to start up and generally is slower with 4 extensions than Firefox with 12 add ons. It is quite sluggish in every aspect, not snappy at all. I have tried Vivaldi now a few times with different configurations but the results are always the same. Uninstalled and changed to Opera since I need a chrome based browser and under no circumstances will allow Google Chrome on my laptop. Uninstalled Opera, too. Was worse than Vivaldi. Guess I have to bite the bullet and stay with Vivaldi, will not put data octopus Google Chrome on my Acer. Sigh, ………. Same experience as you but I opted for Brave as it strives to do one and only one thing well: protect your online privacy. Vivaldi is trying to bring new features, and does not rely on add-ons for basic capability. That’s quite refreshing. Maybe they should be a bit more selective and focused, though, because the claim “another new feature that we’ve added following up on your requests is the ability to control saturation for websites’ theme colors” is just hogwash. One user may have requested that. But “your requests” ? Really ? Rather than cute graphics with RGB measurements (those could be left to add-ons), what I’d like to see is a comparative study between Vivaldi and Firefox based on security, privacy and anonymity. That’s critical, and can’t be provided by add-ons alone. @Clairvaux – “what I’d like to see is a comparative study between Vivaldi and Firefox based on security, privacy and anonymity.” – i’d like to see this as well, even though i don’t use Vivaldi and won’t give it another chance unless i hear about big Speed and Responsiveness improvements. i only hear about new features and a lot of them i personally find useless. Can’t forget about the look of the browser which i find horrible. Vivaldi has a great potencial, I have tried this browser and it’s very useful and its usability is like the best browser software. 1. I would like to not have to re-enable “Show Status Info Overlay” after most updates. 2. Would like the ability to rearrange the order of the search engines. Am I just not able to figure it out? 3. When using the context menu search the search engines do not have favicons but they do when using the search bar. Feels like a glaring difference to me since I use ‘context menu search’ as much if not more than the search bar. 4. Remove the empty wasted space above the tabs when the browser window is not maximized. I’m all about minimizing the vertical space that the UI uses and using it instead for the content. I’ve been using css to remove it but I would like to see the default with the space gone, like it is in FF Nightly without having to use css. 5. Would like to not have to replace the custom css file that I use after every update. Using Win 7 Pro x64 with x64 Snapshots. Vivaldi is nice and fast (4 extensions). For some reason sites look much sharper for me in Vivaldi than in FF. But still, without TMP, it will never be my main browser. The inability to automatically hide and show the sidebar (like with AIS) also bugs me. Number 4, there’s a fix for this in alt+p. That’s like giving directions and saying “you take a left up the road, somewhere”. Thanks? After Firefox announced that they’ll drop the support for XUL apps, I tried to figure out what browser to use now. People mentioned Vivaldi. Vivaldi? This name did not look promising. But I tried it anyway and fell in love in 5 minutes. Many things I needed a bunch of extensions for in Firefox, now built-in in Vivaldi! Vertical tab bar? Check. Custom keyboard shortcuts? Check (any very configurable). Switch between tabs with mouse scroll? Check. And it is so much faster than Firefox. I never looked back since. I installed Vivaldi specifically because it has an extension that operates like ‘coolpreview’ did in FF, to which there has been no replacement. It’s chrome extension called ezLinkPreview. Scratching my head : some folks here complain about Vivaldi’s sluggishness, while others praise it for its speed. I haven’t used it for long enough to have my own opinion. Looks : I like it aesthetically, however I find the user interface a bit too flat for maximum usability. The design is cool, but it prevents you from having a feel at all times of where you are and what you’re doing. Each update only improves and brings new native features! Really like the new features Vivaldi adds. Compare that to Firefox which adds things no one wants like history analytics, and takes away things they do want like old extension system. Still having trouble with tab muting. Currently you can only mute a tab that’s playing a sound. That’s useless if it’s a tab that only occasionally and briefly plays alerts (e.g. gmail). I am sometimes fairly critical but I do prefer Vivaldi to Chrome and Firefox. I just wish they’d concentrate on emulating more of the old Opera 12 features that would allow it to stand out, like the RSS reader. At the moment it doesn’t even recognise RSS feed xml pages as anything but plaintext. Vivaldi looks nice on the surface… but… it is Chromium in the end. The biggest downside for me, also not 100% FOSS – which is of course another important point for many other people. Originally i used Firefox years ago but because it was clear that Mozilla wanted to sacrifice customization to make Firefox more attractive to the Chrome/Chromium community i got rid of it in the end. Switched to various browsers afterwards and settled with Pale Moon. As i heard of Vivaldi i decided to give it a spin for a while – but… No matter how nice the added skin, it is still unstable and bug ridden Chromium Google ware – Which made me dump it after some months. Because a mess still is a mess, even if you put a lot of nice color on it. Anyway, there is also Otter Browser around, which features also tons of customization options Firefox once had and which Vivaldi has – and it is fully Open Source. Therefor my browser of choice in combination with Palemoon! Way better choices as Chromium. Vivaldi is not recommended at all for various of reasons. It also will always be slower and a resource hog because of the non native nature of how the UI is created. And again, it is not Open Source! No thanks!